Founded in 1997, Draper Athena is an early-stage venture capital firm with offices in Silicon Valley, Korea, and China. Big Data, Mobile, SaaS, Semiconductors, Robotics, Novel Materials, Artificial Intelligence, Fintech, and Security. Brought on by the convergence of multiple technological and social trends, the world is going through massive changes. The pervasiveness of silicon technologies, the penetration of Internet and smartphones, the growth of communications bandwidth, and increasing demand for clean energy, have engendered the need for innovation and new technologies. We invest in companies with new technologies that address this need – companies with innovative products and services for the next generation. Draper Athena is a member of the Draper Venture Network. 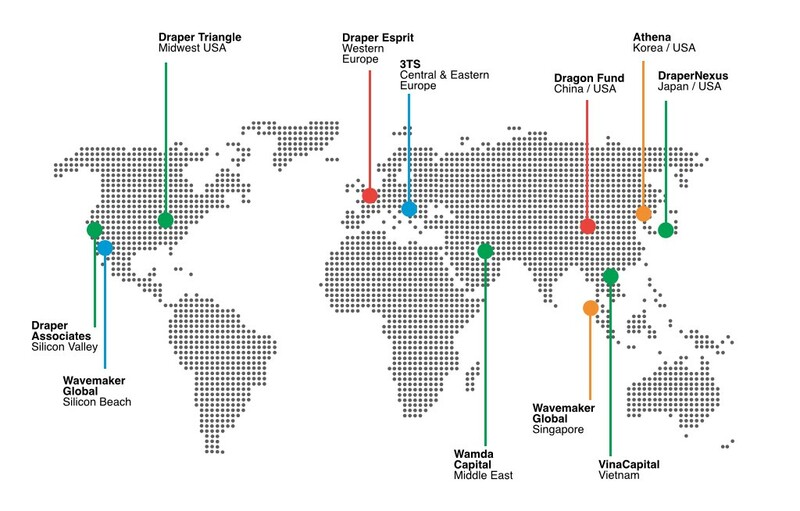 The Draper Venture Network is a global network of venture funds that bring together leading investors and entrepreneurs from broad sectors and geographies under one umbrella in order to share knowledge and opportunities. The Network currently has over 30 offices globally, manages $1.6 billion in AUM and has 500+ portfolio companies. This is the largest VC network in the world with unmatched access to deals, innovative insights to leading trends, and extensive scale of GP network. Anoto Group AB is a cloud-based software solution provider based on its patented dot pattern technology which provides a methodology for accumulating digital big data from analogue inputs. Its technology has been deployed in consumer applications such as smart pens as well as in enterprises including healthcare and education. Coinplug develops Bitcoin platforms including the Bitcoin exchange, electronic wallet service, online POS (Point-of-Sales) service, and mobile Apps. These platforms will become the most promising online payment methods in a mobile environment. They are the first in Korea to provide direct transactions between customers and merchants using Bitcoin; and to provide a network of ATMs enabled for Bitcoins. DecisionNext is a SaaS company enabling risk-aware decisions for companies in commodity industries. Its solution is based on data analysis and machine learning. It enables buyers and sellers of commodity to generate better forecasts (i.e. pricing) so that significant cost-savings can be achieved. Its solution is widely used in meats, grains, natural resources, and chemicals industries. Forge Global is a developer of an online trading platform designed to empower investors and shareholders by providing access and liquidity in the private market. The company's platform helps to bring liquidity to illiquid assets through technology, enabling wealth managers, asset managers and family offices to access to private markets. IDEA Automation is a fully integrated robotics systems company. Initially developed for semiconductor chip packaging, its systems are now used for food packaging industry in China. With strong IPs and operational expertise, the company completed building a state-of-the-art manufacturing facility in China to expand its reach into food packaging and electronics industries. Metadium is a blockchain ecosystem that allows for the expansion of blockchain platform. Metadium aims to accomplish complete digitalization of real world. Metadium solves the issue of on-line trust identity and formulates firm connections between identities. It completed a successful ICO (Initial Coin Offering) in 2018. GPM is a developer of a launcher system that publishes and manages VR games from multiple game developers. Using its launcher, GPM began building its own VR theme parks under the MonsterVR brand, which has received an unprecedented consumer response. The company is in the process of global expansion of its VR theme parks including Asia, Europe, and America. HunetPlus is a specialty chemicals company with expertise in display and electronics industries. The company has developed the next-generation materials for OLED including overcoat, insulator and barrier ink. It has also developed the world’s first commercially viable NIL (Nano Imprint Lithography) technology for LEDs. Inka Entworks is a leading DRM (Digital Rights Management) and mobile App security company. Its DRM provides authentication and rights management for digital content. Its App security solution called AppSealing is a new product, which allows App developers to focus on development while outsourcing the security component to Inka Entworks. Moloco is a mobile advertisement monetization platform as a service. Its machine learning platform increases the effectiveness of advertisement. Its customers are widely utilizing the Moloco’s technology to acquire users or to monetize on their traffic. MXD3D solves the problem of “fixing” in 3D printing. Today, most 3D files need hands-on “fixing” before they can be printed. Also, each file does not print equally in all 3D printer models. With its cloud-based software, the company solves these problems. Furthermore, its plug-in software for online games enables the real time capture and printing of gameplay moments. Nexia Device Company Ltd. designs and manufactures multimedia non-memory semiconductors. The company's products include 2D-to-3D real-time image conversion chips, living appliance device processing chips, portable multimedia device processing chips, and SoC embedded IP. Nexia Device markets its products worldwide to multimedia device manufacturers. Ramsway is a developer of mobile and M2M memory products. The company has the full design, test and packaging capability. It develops MCM combining NAND and DRAM memories for broad applications to customers globally. Relay2 develops a single, unified WiFi platform that lets you leverage the cloud and your network edge to build, deliver, and manage money-making business apps that engage customers and rapidly grow your business. With its unique architecture of multi-level and multi-tenancy, Relay2 partners with service providers to deliver its infrastructure as a service. SM Global is a leading manufacturer of golf balls with its operations in Korea, US, and China. Its products are among the highest quality, yet marketed at the lowest price. The most well known product is Kirkland Signature, the private-label golf balls developed specifically for CostCo. Swing provides the eScooter-sharing service in Korea. The Korean market is evolving in a similar fashion as the US where the congested metropolitan market is ripe for the last-mile transportation services provided by companies like Swing. The company is led by a team of mobility experts. Takoma is a novel materials developer based in Chon-Ahn, Korea. The company has expertise in photo compounds (photo initiators and PAG) and polymers for display products. Some of their industry-leading products include high performance barrier materials and low-temperature encapsulation materials, and novel materials for flexible OLED displays. Yap Stone is a smart city platform developed on blockchain technology. This platform allows the exchange of regional cryptocurrency called Yap Token via a proprietary exchange where the tokens are issued for applications specific to the local economy including communication, education, finance, shopping, energy, or digital certifications. Zeuss Technology develops the technology for KYC (Know Your Customer) and AML (Anti-Money Laundering) for cash intensive industries such as cannabis so that it will provide the banking services for such industries. CallGate enables businesses and consumers to push targeted data services to smartphones via the smartphone’s voice channel. The company’s technology allows enterprises to improve customer service, increase revenues, and lower operating costs through more efficient and effective call center operations. Creative Design Systems provides a hot-pluggable thin-server solution enabling the NT and Unix network attached storage markets. The company addresses the market need for cost-effective and high-performance solutions for data access. DemandTec provides pricing optimization software for retail stores with large numbers of SKUs. Its algorithm leverages differences in price elasticity for different SKUs to optimize storewide profitability. Imparto develops marketing automation software enabling enterprises to manage web content, with tools to keep sites up-to-date, manage outbound email campaigns, and reduce time spent on administrative details. Impli delivers a rich mix of information, entertainment, and advertising to customers waiting in line. Strategically placed video screens capture and hold consumers' attention and provide an unbeatable advertising opportunity. Impli's screens are placed where customers often have to wait. IPivot provides an intelligent content routing load-balancer that increases the reliability, performance, and scalability of web-sites, e-commerce servers, and corporate intranets. Khancera develops high performance products for the automotive and industrial diesel engine markets. The company has developed an innovative Diesel Engine Particulate Filter (DPF). The revolutionary product design enables low cost manufacturing while maintaining high performance. Its products are targeting the global marke. Mobeam is transforming mobile commerce with its patented light based communications technology. Mobeam overcomes the technical barrier preventing mobile phones from interacting with laser scanners and provides universal access at point of sale (POS), enabling the transmission of coupons, gift cards, tickets, and other barcode data at retailers worldwide. Minigate is a provider of mobile platform technology focused on e-education and sports marketing. Its technology allows content providers to seamlessly deliver and manage content to their end-users. Key applications include children’s education, professional education, and sports marketing. OGPlanet is an online game and community portal. The companies brings casual MMO (Massively Multiplayer Online) games from Korea and markets in the US and Europe. Games available include Uncharted Waters, Metro Conflict, La Tale, and Legends of Honor that span across a broad genre. Persist Technologies provides application-centric storage software for enterprises who need simple, high-performance solutions for scalable content management. With Persist, users can cost-effectively store and retrieve high volumes of static content..
ProfitLogic provides markdown optimization software for retailers in the fashion industry. ProfitLogic processes sales data and, using advanced algorithms, provides pricing markdown solutions to optimize net income for its retailer customers. Vivid Semiconductor designs and markets mixed-signal analog integrated circuits for high volume computer and consumer applications. The company developed a patented process for manufacturing extended voltage ICs using a standard digital CMOS process. ZANTAZ provides digital Safe archiving servics and patent-pending Indexing Technology, and a Rapid Response Professional Services team that help clients capture, restore, archive, and instantly retrieve electronic documents, while complying with governmental and industry regulations.